Voted best-selling warm-weather top! Half-Sleeve Zip Top with its distinctive black zipper neck opening and generous half-sleeves. Adjustable pull-cord at side hem makes this one of the most distinctive and versatile tops Ezze Wear has to offer. VERY Generous (actually over-sized) S, M, L, XL and some in 1X. Be sure to check bust measurements in Size Selections. Mid Hip Length. 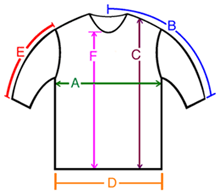 A: Chest / Bust circumference 47-48" 52-53" 56-57" 59-60" 64-65"
B: Sleeve length from center of neck to end of sleeve 22" 22" 23" 24.5" 24.5"
C: Body length from shoulder to bottom of hem 26" 25.5" 27" 27.5" 29"
D: Hem circumference 45" 45" 51" 56" 59"
E: Sleeve length from shoulder to end of sleeve 12" 12" 13" 13" 13.5"
F: From the bottom of the V-Neck to hem 20" 20" 21" 21" 23"
I love these shirts & have been a loyal customer of this company since its previous days as the Oregon Cotton Mill. Unfortunately your company is very limited in stock. I would love to order some of these, but the colors I chose are out of stock. This is the first day of your new email sale posting, and you have such limited colors. I already have the colors you have in stock in my closet. Please improve your stock. I just love this top but people should really know how over-sized they are before ordering them. Check the sizes!